Rachel Stern's latest photographic series, More Weight uses Arthur Miller's classic play as a metaphor for the chaos of present-day media, culture, and politics. "More weight," Giles Corey's famous last words spoken while stones were being piled upon him at the end of Arthur Miller's The Crucible is a historical symbol of resistance to the tyranny of the Salem witch trials. Philadelphia-based photographer Rachel Stern uses these words as the title for her latest exhibition – on view at Brandeis University through October 26th – a metaphor for our current uncertain, often logic-free times. Her photographs are unapologetically staged and intentionally contrived, casting our current political and cultural climate as a theater of the absurd. I spoke with Stern to learn more about how this brightly colored pastiche of confusion relates to her ongoing practice and reflections on the world in which we live. Jon Feinstein: I love this work. How did it begin? Rachel Stern: For a few months, I had been suffering from an overwhelming desire to entirely restructure my practice. The feeling of making my own work had become dull and predictable. During the same period of time, I had unconsciously given up listening to music almost entirely and replaced that with an endless stream of news and analysis. I developed a particular penchant for conversations surrounding the law and the court. As is the case with most anything I engage with I turned to a literary filter as an emotional foil to this new fascination. Feinstein: The title – "More Weight" – comes from what's likely the most famous line in Arthur Miller's The Crucible. Stern: I had been re-reading the play and listing to a radio production on loop. That line just said everything to me. It implied how heavy and grave everything feels, but also the potential for MORE weight. It outlines an act of bravery within a morally perverse system in which I am not particularly inspired by the martyr's convictions - so futility is there. On a personal note, as a queer fat person, it just felt like a phrase which describes where I was at. From the words came the work. Feinstein: Why do you think The Crucible and that famous line are particularly relevant today? Stern: As I have been revisiting the text (and accompanying films and cultural fanfare) I have come to some different conclusions. I saw in Miller’s narrative a salient conversation surrounding the #MeToo movement. The women in his play, really many of them are children, are in no uncertain terms raped by their employers, shamed for their sexuality, and pitted against each other in desperation for survival and power. Tragically this was lost on me as a young person who read the sexual shame as justified and logical. Being able to re-engage with content in a critical manner is a way to celebrate it. James Baldwin said, “I love America more than any other country in this world, and, exactly for this reason, I insist on the right to criticize her perpetually.” This is the soundest logic. I believe in mass action, mass collaboration, and the power of the people. This is to say that it is important to me that we do not focus on the collective as a threat but rather as our greatest tool. More Weight images the correlations between spectral evidence and fake news, witch trials and witch hunts, preposterous governances, and lame courts of law all of which contribute critically to the precarious position we find ourselves in today. Feinstein: What role did The Crucible play in your education and identity growing up? Stern: There is a legend in my family. I guess it's not really a legend so much as the truth — that Arthur Miller is a distant cousin. I know it's the truth because I remember going to celebrate holidays at my Great Aunt Sandy’s house and seeing Arthur’s sister Joan Copeland. She would always be reminiscing about visiting Alexander Calder’s studio or hanging out at The Factory and I remember her asserting that Arthur was the famous one but Kermit (the other brother) was "the one who was really worth a damn." In my adolescent mind, I went straight past Miller to Monroe! Baby punk rock Rachel got such a thrill from insisting that strangers see a resemblance between myself and Marilyn even though we were only related by (a brief) marriage. On the other side of my family is a history with the radical left. My grandfather Fred was an Austrian refugee who came to this country after Kristallnacht and became a labor organizer in Indiana steel mills, a communist, and eventually a professor of English. From this part of my family, I hear stories about friends being brought before the House un-American Activities Committee and of the agent who parked outside the family home and followed my grandfather as he walked my aunt to her first day of kindergarten. Outside of both of these familial societies, I grew up as a Jew in New England. We have our own history in New England but I can’t say that I felt particularly represented by or embedded in most of the society that surrounded me. The confluence of these factors has led me to always hold a fascination for Miller’s story about this iconic New England event. He is a Jew preoccupied by a colonial history and engaging with political, social, and even perhaps religious oppression. This felt like a particularly relevant path to follow for an exhibition at Brandeis which was founded in New England by the first Jewish Supreme Court justice as a first chance for Jewish students to seek higher education without discrimination in the United States. My Great Aunt Carol recently told me that she was in the fourth ever class to enroll at the school. Feinstein: These are elaborate pictures. I’d love to hear more about backstory and process. Stern: Amid the persistent chants of "witch hunt" and "fake news," and beneath the looming shadow of nouveau-McCarthyism, Arthur Miller’s play The Crucible became a touchstone for my thinking. Spectral evidence, mass hysteria (hysteria as an anti-feminist concept unto itself), and a pervasive latent sense of madness constitute our current cultural disposition just as Miller observed in the Salem colony and pointed out in the House un-American Activities Committee. I began chasing Miller’s storyline with my camera; first traveling to Salem and lurking around cemeteries and wax museums, then returning to my studio determined to make something that - in whatever way - broke my own mold. 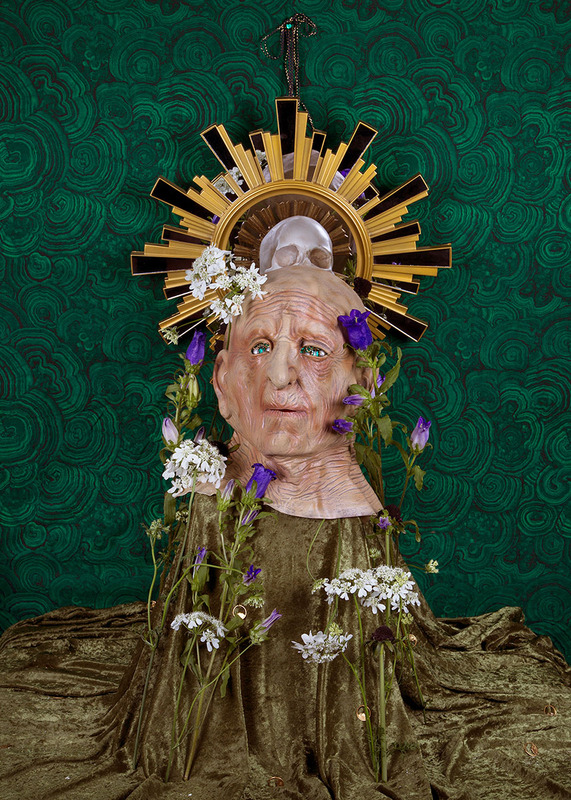 I spent a few months making a series of strange dusty colonial portraits. I shot with natural light at f2.8 and placed dried grasses in front of the lens creating veils through which my friends and family, posed as puritans, could be spied. I tarred and feathered a hay bale. I tried to make my friend’s dogs fight over scraps of raw meat but they were too sweet and well behaved and shared the treats nicely. The pictures were okay and certainly met my desire to break my habits - but isn’t it funny how the grass is always greener…. Feinstein: I've seen an increased reference to witches in art and pop culture narratives in the past couple years. Why do you think this is? Stern: There is a great book by Silvia Federici called Caliban and the Witch in which she lays out a very compelling, historically driven, and economically centered argument about the witch as an important means of Capitalist control. Federici attests that it is specifically women that inspire a certain threat to a capitalist agenda. She beautifully illuminates histories of women leading in labor, reproductive rights, and philosophy which threaten to destabilize the oppressive hold of our economic system. Beginning with the end of feudalism, she outlines the use of the figure of the witch and the accompanying accusations and repercussions as a tried and true form for suppressing women’s political and civic voices. Feinstein: I've also seen many parallels between feminist and queer narratives and witches-as-metaphor. Stern: Federici outlines a real history which makes it all the more perverse to consider our current administration’s fondness for the notion of a witch hunt. I think the simple answer is that women and queer people are recognizing the witch as a symbol of empowerment rather than shame. It is a history ripe for reclamation and resonant with this moment. There is also a certain cachet in aligning oneself with this powerful, vengeful, underdog. More complicated is our deep abiding desire for a magical, simple, better-than-real-life-could-offer way out. Witchcraft is just that. In an intersectional world, we know that being a feminist isn’t enough to realize our feminist goals. One must also be a socialist, anti-racist, anti-fascist, environmentalist, and so on. There is no way to accomplish anything outside of an understanding of an intrinsically linked struggle. The witch is one whose powers transcend any one silo and is able to make what she wants of the world out of her will. Who wouldn’t yearn for that in such a bleak moment as this? Feinstein: These are all made in-studio. Why is that important to the project? Stern: The studio is for me an important location from which to engage with the world. I think the studio has a bad rep for being somehow removed from the continuum. For me, I think of it as the archaic studiolo - a place where I can go to examine the world as ordered by my own sensibility and greatly influenced by the predilections and preoccupations of my cultural moment. I also stand in defense of Pictorialism and see my work as an extension of that movement. In my history of photography classes in school, I always felt that Pictorialism was written off as this goofy and shameful first attempt to make photography Art instead of valiantly embracing its ‘purely photographic’ and thusly system-bucking qualities. Less often have I heard celebrations of the feminist and queer threads that Julia Margaret Cameron and F Holland Day smuggled into their allegorical and illustrative images. I choose to work in the studio because I have seen the studio function as a stage, a mirror, and an oasis in which some of our most important emotional, political, and social thinking has occurred. I am always interested in photography’s ability to reveal things about ourselves (either individually or culturally) that we might not intentionally bake into the work. The studio is a place where all of our social understandings can unfold. It is inside a studio that I see how Hujar mourned a community on the verge of extinction, how Claude Cahun was able to defy any and all expectations of what being human in her moment might have been, and how Avedon deftly removed the social armor of an entire generation of great minds. I see the studio as a place of potential and as a primal murky soup from which to discuss the world. Feinstein: How do you think this relates to your previous work and larger practice? Stern: My goal is to express as directly as possible my experience in the world. I do not believe in exceptionalism or that my experiences and perceptions are in some way elevated. We are all on some level afraid, in awe, in love, disgusted, and entranced. This is the bedrock of my work. Whatever topic I might be interested in - men, radicals, kitsch, death, art history to name a few past works - will always play second fiddle to the more essential and emotional and political undercurrents in my work. If one comes to my exhibition and leaves thinking about the law I am thrilled. If one comes to my exhibition and leaves thinking about how much they fear bodily harm I am thrilled. If one comes to my exhibition and leaves thinking about how beautiful mass-produced cheap stretch velour is, I am equally thrilled. This is to say that all of my work is for my audience and my audience is (at best) everyone. Feinstein: Who are the people in some of your portraits? How much does their identity matter? Stern: The people in my portraits always matter… to me. I am not sure that I care if anyone else knows or understands but since you’ve asked I am very pleased to tell you. I photograph as an honorific form. I photograph people I love or at least admire. For my work I have photographed precisely one stranger and that photograph, having been made back in 2013, remains a strange thorn in my side (a mixture of admiration for that immediate intimacy and awkwardness for the same reason - it is not in this exhibition). The sitters in these photographs represent my friends and family. I have recently moved to Philadelphia - well it’s been a few years now but my friends and family are mostly not here with me. During the period I was working on the show my policy was that if you came through town (or live here) I would photograph you. It was the most fun and beautiful experience. The photographs are of my mother and aunt, my siblings who all make up ‘The Jury’, friends from high school, grad school, and college. There is a lot of fear in photography about representation. We want to make sure we either are or aren’t hurting people intentionally or otherwise and that the camera is complying with some ever-morphing ever-unclear sense of morality. One cannot talk about the law without considering all those people it represents fairly, and all those people it abuses and disregards. I felt very certain that the only ethical approach to inclusion and representation in a work like this would be to earnestly photograph those people I know and those people who populate my life in order to let the absences also occupy space. It is important to me that I do not present some moral authority or assume a moral infallibility in my production of images. The artist should not be synonymous with some sense of goodness or truth. That is a dangerous game to play. I want to own every part of what I do including the blind spots and mistakes. As a part of that, I cannot imagine casting a model for a photograph. I don't condemn the practice but for me I cannot ask someone to play, for example, the villainous and patriarchal role of The Judge unless they are also a person whom I love and trust enough to be cast in that light with full consent and participation in imaging a villain. Photography’s greatest power and burden is that it is, always, specific. Feinstein: What's the significance of the multi-colored gloved hands? Stern: The wallpaper with the red and blue hands is probably my most tongue and cheek political move. The red and blue stand in binary opposition to one another and move between accusing (pointing the finger), passing judgment (slamming the gavel), and making deals (shaking the opposing hand). They are meant to function as a Greek Chorus who both drive the narrative and add a great deal of cacophony. Feinstein: Back to the personal connection – has making this work helped resolve the issues you mentioned earlier? Stern: What the photographs really gave me was the confidence to trust my own aesthetic; to see my previous works as logical building blocks for whatever might come next. Back to the studio, but this time with more confidence and trust in myself. In this work I have returned to my love of symbols, enthusiasm for the history of visual culture and visual literacy, and used my sensibilities to create new works which were more logically born of the old. I allowed myself to indulge in everything from the WAP to Medieval manuscripts bouncing back and forth from The Crucible but never being stuck there, never feeling beholden to the text. The result is the project More Weight which synthesizes my conceptual and emotional love of kitsch, the baroque, and maximalism with the sentiments of Miller and other larger conversation (both historic and contemporary) surrounding out attempts at governance.